Have you ever wondered what it is like to experience God in everyday life? How do we grow closer to God and feel his love? Where and how do we mature and change? This book grew out of Elaine’s spiritual renewal as she went about her daily life as a missionary in Japan. Many but not all of the devotionals are about her life in Japan. But all of them you can relate to as she attempts to honor Christ with her life, both inward and outward. The real-life illustrations help Scripture come alive in a fresh way. These thoughts can be read in bits, so it is a great for personal devotions or a gift for someone. The book contains 52 devotionals including some devotionals for holidays. 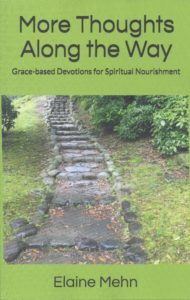 Her previous devotional book Thoughts Along the Way, was published in 2002, which will soon be in Japanese. 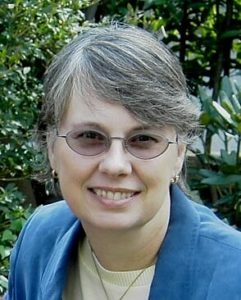 Elaine Mehn, along with her husband John, has been serving as a missionary in Japan with Converge since 1985. She teaches grace-based renewal Bible studies (including Sonship) for pastors’ wives and missionaries. She leads community outreaches to women such as western cooking classes, needlepoint, and craft classes. And she works in conjunction with her husband’s church planting and leadership development ministry. Elaine grew up in Iowa and graduated from Upper Iowa University. She and John have two children and two grandchildren living in northern Illinois. The vibrant reality of Elaine’s walk with God and her deep honesty is clearly seen in “More Thoughts Along the Way” in her glimpses into what it means to live with God. Her insights are tactile (Kotatsu, Earthquake), humorous (Deflating Bed, Cowboy Boots), nostalgic (Five and Dime), graphic (Glass of Radioactive Water), and always personal. Yet, what she writes is not merely experiential, helping us to hear God’s Word by the Spirit through these tangible things. More than that, and what I love about her most, is that she seeks to be satisfied only in Christ and she calls me to do the same. Throughout the 52 weekly devotions, Elaine Mehn gives each scripture passage a fresh view with the gospel lens. This helps us to see our heart issues as well as the overwhelming grace given to us. Her insights carry global truth and would touch anyone who reads her book, whether from America, Japan, or any part of the world. I have noticed over the years of serving in Japan that there have been times of walking hand in hand with my Savior Jesus and times of drifting and dryness. For many years I thought this dryness was a normal part of a maturing Christian life. I have come to realize that while it is common among believers, it is not normal. God does not give and take away His Spirit but rather promises to always be with us His children. God’s amazing blessings to His children include forgiveness, a right standing before God, acceptance, true value based on Christ, the joy of repentance, and a growing faith. I pray that as God has and still continues to work these in my own life, He will work them deep into your heart as well. My prayer for you, as you read these devotions, is that you will come to a fresh enjoyment of this journey with Jesus. No matter if you are in a valley, on the climb to the mountain top or have reached one of the many mountain peaks, I pray that you will experience the fellowship of the Spirit, a cherished devotion for Jesus, and a heart filled with worship and praise for God our Creator and Father.